Friday lunches are a bit hit and miss. Usually because Thursday night is Film Club at work and we don’t tend to get home until quite late. This week we watched ‘Cube’ which is a very low budget Canadian film about some people that have been put in a cube full of rooms and traps. It wasn’t bad but the acting was pretty poor. That said I will be giving Cube Two and Cube Zero a go just to see if they get any better! We got home pretty late and I prepped the mayo for this before we went to bed. It’s a very good vegan mayo and is almost a runny guacamole. The ingredients are quite similar except for the lack of any chilli. The may is simply a large avocado, rapeseed oil, a little english mustard and some cider vinegar in my Nutribullet and blitz until smooth. Couldn’t be easier. 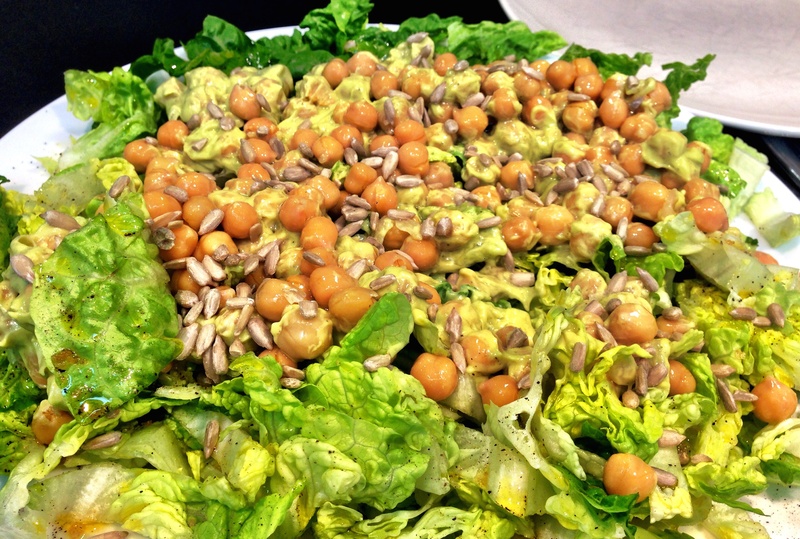 Serving was simply some crisp lettuce, chickpeas, the mayo and some sunflower seeds. The dish is another Hugh Fearnley Whittingstall offering from River Cottage Light and Easy. The mayo had me curious the first time I flicked through the book and I knew it could be used elsewhere so why not give it a go. Personally I think the mayo didn’t go so well with the chickpeas. The dish was very balanced and was quite tasty but there are better things I would have put it with – even just dipping Nachos in it would have made me happy! Not bad though! 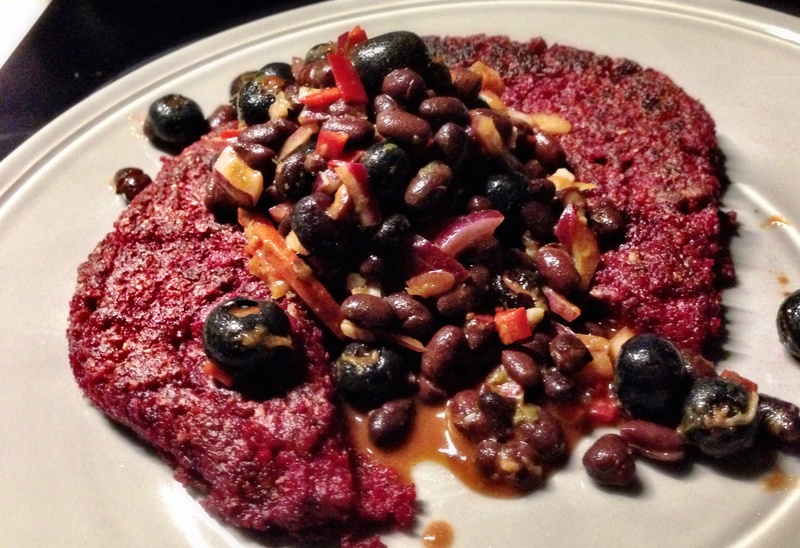 Sorry about the picture – It kind of all got thrown on the plate in a rush! Every other weekend we don’t really get to eat very well. My daughter comes to stay on Friday thru’ Saturday and then on the Sunday we go to Freya’s parents. Killing two birds with one stone as it were! My daughter lives a fair old way away and by the time I’ve picked her up and brought her back to the boat it is usually way too late to eat. So we tend to have a big lunch on the Friday and power through to Saturday morning – or we grab something on the way to picking her up. After spending the day in the British Museum on Saturday and safely dispatching my daughter back to her mother, I got home and threw this together. Very little effort – just time roasting the vegetables. But it is very tasty. The plan was for Freya to cook while I took Olivia home but there was a mix up with the boat keys so Freya ended up sat in a pub knitting for two hours while I was gone. On the plus side I now know that the Magpie and Crown has two new Craft Ales on tap – and both were excellent! This recipe is also from Hugh Fearnley Whittingstall’s River Cottage Light and Easy cookbook. I’d highlighted it as one of the dishes I was going to make when I skimmed the book and it was well worth it. 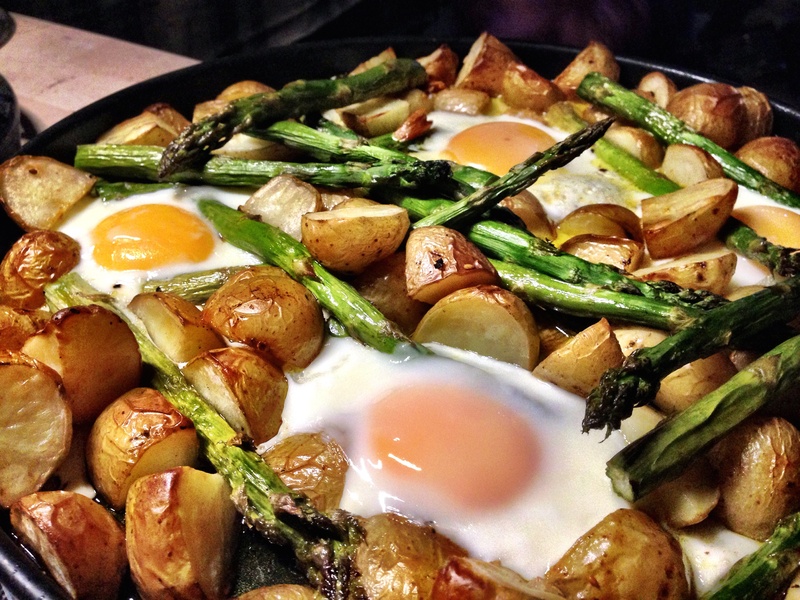 I love asparagus and it goes very well with eggs too. 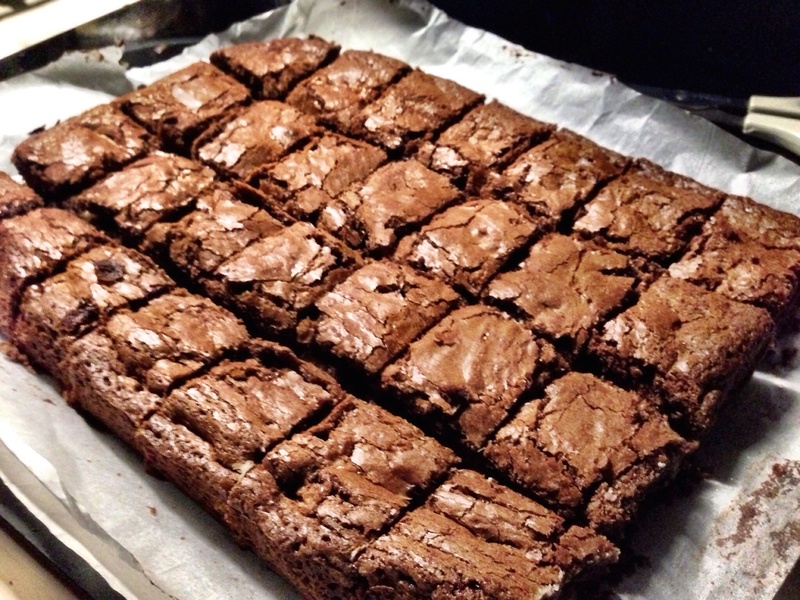 It’s not much of a recipe more than bake stuff in the oven. You bake the potatoes, then add the asparagus, then right at the end make four wells and crack an egg into each well. Bake until the eggs are done and serve. Very simple indeed. 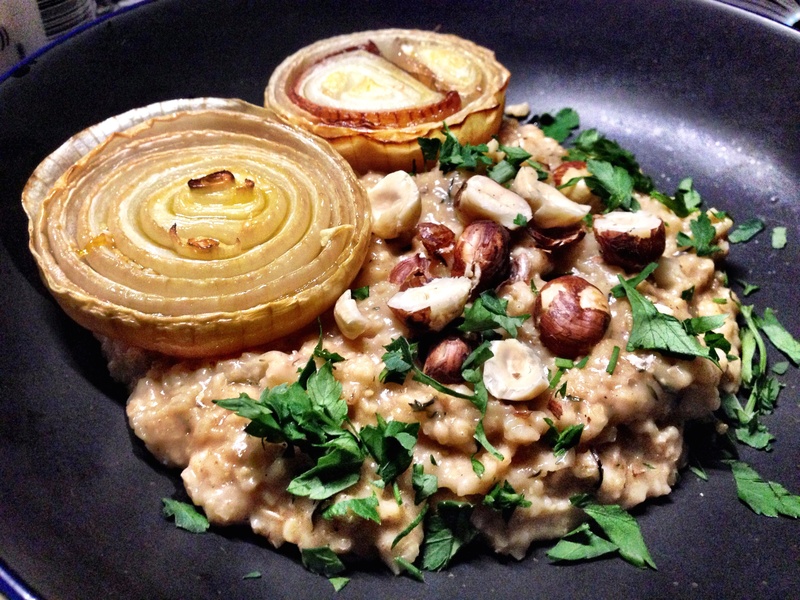 On Sunday I remade the Shallot and Mushroom risotto and the Brussels Sprouts, Puy Lentils and Walnuts for the six of us. It seemed to go down well although it wasn’t as good as the first time I made it. The only thing I changed was the stock and the quantities – their oven was just more feisty than mine and the onions were overdone in my opinion! Tuesday Nights is Rock n Roll dancing and Hedsor. Dinner needed to be quick as we have a reasonable drive from West London to Maidenhead so I same up with these two dishes. Dancing was great this week. During the lesson we rotated partners and ended up dancing with everyone. Very cool. Really helps you realise what you’re doing wrong and how different people dance in different ways. Lots of newcomers too. So we aren’t the newest ones there anymore! Surprisingly we had time to watch Broadchurch before we went out. Not sure we like this series as much as the first one. Lots of sleuthing – not enough detective work. Lots of sub plots – not enough focus on one thing. We shall see! The Broccoli takes minutes. The potato cakes need cold mashed potato so you’ll need to do these in advance to allow them to cool down. The broccoli dish is simply a medium-hot pan – toast some almonds but don’t burn them and allow to cool. 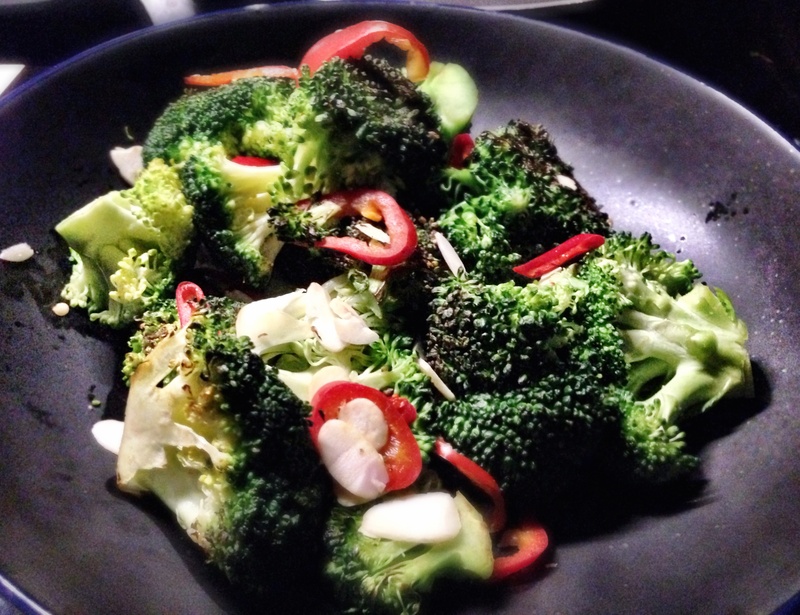 Then dry fry the broccoli for a good 10 minutes – add the red chilli – fry a little more then serve with the almonds. This dish was too hot for Freya. The broccoli really takes on the heat from the red chilli and she wasn’t a fan. I loved it. I love chillies. I added a mustard dressing which made the dish far more enjoyable for Freya. The dressing was simply mustard, egg yolk, cider vinegar, oil and garlic all whisked together. The potato cakes are simply mashed potato, baking powder and rice flour, mixed together and fried as patties until they go fluffy. All in all a very simple dinner. Nothing special but very tasty and a good fast dinner that filled a hole. Doesn’t everyone always have a bag of carrots lying around in the bottom of the fridge. I know I do. Every time I go shopping I get carrots and I never use them all. They are so cheap that you always just buy a bag, use 2 and leave the rest to shrivel up in the fridge. Well this dish could be the answer. Well – a better answer than carrot and coriander soup – which I just don’t enjoy! Another offering from Hugh Fearnley Whittingstall’s River Cottage Light and Easy cookbook, this does use up a kilo of carrots with minimum effort. Simply prep the carrots, toss in sesame seed and rapeseed oil and roast. Season them and roast them until they caramelise. Job done! But what’s that you see in the picture – raisins? 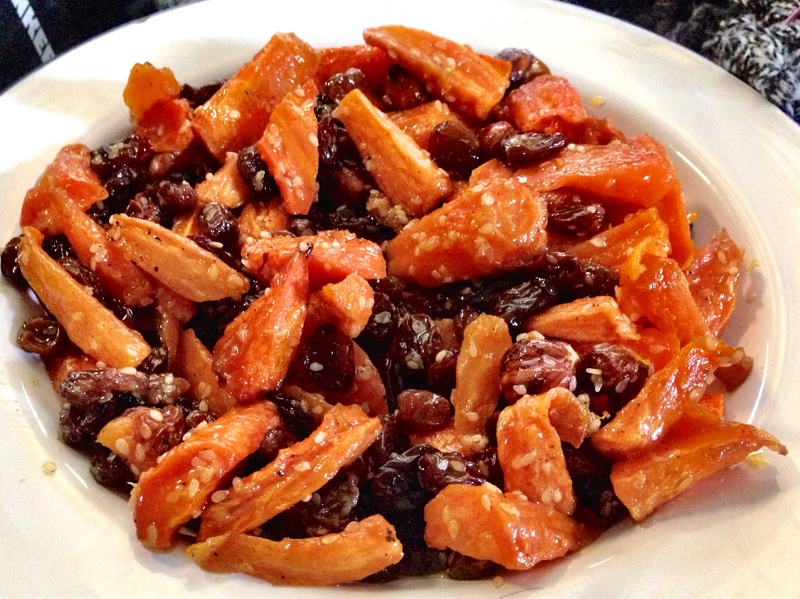 While the carrots are roasting simmer some runny honey and some orange zest and juice and add some raisins. Turn off the heat and let them soak up the juice. When the carrots are ready, add the raisins and serve with a little chopped parsley. Very simple indeed. I had every intention of serving these as a side yesterday but it got too late to eat – so I ended up eating these on their own for lunch. I didn’t have anything else to eat as my Ocado order doesn’t come until tomorrow morning. These are quite sweet and very orangey – the carrots really soaked up the juices from the raisins. Not sure they work on their own. Probably better to serve these with something more substantial.